I've been using quite intensively Dell D600 laptop for almost 5 years. This unit was manufactured in 2003 (I'm not it's first user) and equipped with Pentium M 1.60 GHz (Banias) and Broadcom BCM4306 wireless. Advertised magnesium alloy chassis does not seem so rigid on the first look - at least comparing to old IBM "T" series. Most of the parts are made of plastic, only magnesium alloy parts are display cover (but it does not look sturdy - it is easy to bend a little) and frame, but not the back of front of the cover. 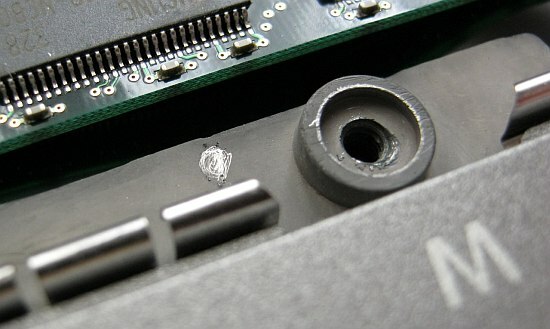 Fragment of the frame is visible when battery is removed or under memory bay cover. wearing of palm rest coating that changes its color and texture. so called "Dell Wireless Utility" - wireless connection manager - seems to have huge memory leak causing problems when laptop is running for days; fortunately it can be disabled and standard windows utility can be used instead; another advantage of windows utility is also faster reconnect after resuming from suspend state. Real capacity of battery has dropped to about one third allowing for 1 hour of work with wifi enabled. I believe this is still quite good result caused by the fact that laptop worked without battery most of the time. Although more annoying than capacity drop is battery miscalibration resulting in incorrect (higher than actual) remaining work time and going to hibernation without warning. Unfortunately haven't found any calibration utility. Undervoltage is worth a try. Settings I use 0.748V at 6x multiplier up to 1.244V at 16x multiplier. I've tried NHC and RightMark CPU Clock Utility. NHC seems to have reacher feature set, but I would recommend RightMark for the simple reason that it is not using .net platform. It loads faster (noticeable at cold boot) and consumes less RAM - why waste resources for application that basically sits in system tray? 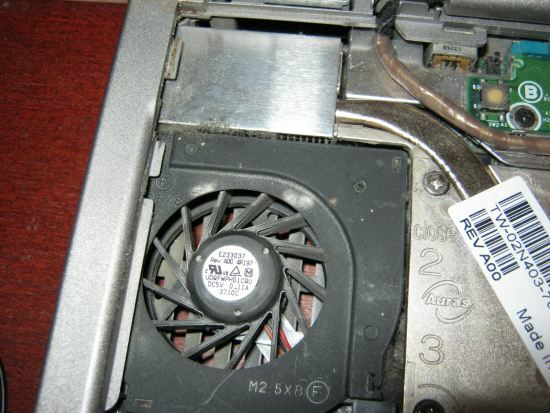 When infrared port is enabled it periodically emits high-frequency noises, not loud but very annoying. 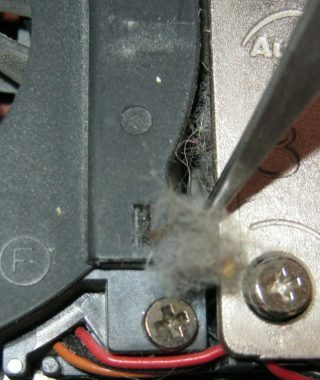 It could be mistaken for HDD problem because of its near location. I haven't seen this problem under linux, most likely noises are emitted only OS/software is searching for nearby devices. On windows noises disappear when device is turned off using device manager. Beware of WLAN driver in USA version. Usage of 802.11 channels 12 and 13 is restricted in USA and if you'd install driver version intended for USA (R143355 instead of R143352) you won't see access points working on these channels in WiFi monitor - might be difficult to diagnose. CPU thermal throttling, i.e. temporary slow downs when playing games, especially CPU intesive ones. 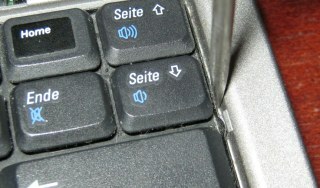 Remove plastic panel above the keyboard. Start with releasing latch at the right side using flat screwdriver. 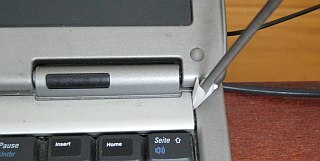 Cover screwdriver with i.e. paper to avoid accidental scratches. After this there are three more latches that should be easy to release just by pulling plastic panel up. Clean area at the ventilator. Check by looking against the light at the back.